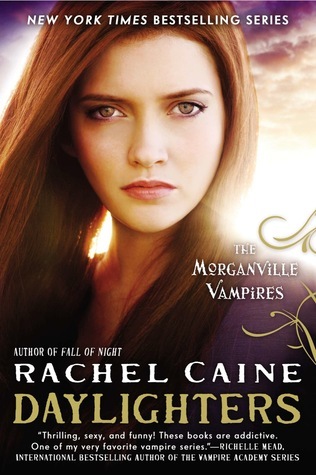 As much as I love Morganville, and as sad as I am that Morganville is now finished, I found that Daylighters is not my favorite one in the series. I still really liked it, because I am such a huge Rachel Caine fan, and there’s a lot of awesome in Daylighters, but it’s a really liking this kind of awesome. Seeing what happens when Claire and everyone gets back home, and seeing how different Morganville is now that the Daylight Foundation has taken over the town…wow! Definitely interesting to see what they did with the vampires, and some of the things they did to ensure that vampires and humans don’t mix. And the head of the Daylight foundation, and his connection to Myrnin and the vampire community was interesting, but also unexpected. In a good way, because it’s definitely different. I’m honestly not sure what I was expecting for Daylighters, but it’s totally not a bad thing, because it really could have gone in any direction, and because I wasn’t sure what would happen, which was kind of fun, because I was surprised a couple of times. Overall, it’s not that surprising, what happened, and I suppose it is what I was expecting…but maybe I was still processing Allegiant, and didn’t pick the best time to do another series-ender. But maybe not. Who really knows why I really liked it but also feel a little meh about it? I will say that things did end very well, and while Morganville is definitely a different town at the end of the series than it was when we first visited, it’s still a crazy town with quite a few surprises. And…there may have been some silent squee-ing towards the end, because our two favorite couples get their HEA. Which isn’t surprising, since they’ve been through a lot, and it’s good to have that. We definitely get closure, and things are wrapped up so well. But…it’s also fun to imagine what everyone will get up to! Morganville and its residents really are very different now than they were in Glass Houses, and the things that they’ve been through have made them better (and interesting) people. I really liked Daylighters, but it also didn’t have that special thing that made me go OMG. Still, it’s a great ending to a series that I’m definitely going to miss, and I’m sad to see it end. Daylighters gets 4 stars.